The Spur Cross Ranch Preserve is one of my favorite photographic venues. It doesn't hurt that I don't have to drive a hundred miles to reach it either since it's just outside of Cave Creek, Arizona a mere 25 miles from home. I find myself going out there quite a bit checking on the progress of the Fall colors along Cave Creek. The creek is lined with giant cottonwoods and surrounded with some nice mountains. Clouds are the only limiting factor and I won't shoot without them. On this day, I lucked out as a fantastic spread of clouds covered the sky. The sun was playing peek-a-boo and full sunlight was fleeting. I walked along the road to get this 180-degree view from above the creek. The Fall color was still a couple weeks off though. Shortly after I arrived, the clouds couldn't have been more interesting. The bend of the creek, the rising mountains behind and the clouds radiating out like lashes accentuated the effect of making the scene look like an eye. I was surprised how much all these factors created this fisheye look. The sunset wasn't a disappointment either. I hiked up a nearby hill so I had a good view to the west and would be in position. Still, it wasn't the barn-burner I was wishing for. 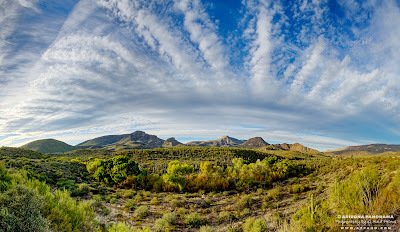 This view looking back towards the town of Cave Creek was very nice too. The sunset continued to go from yellow to red and purple. The city lights added a nice feel to the scene. 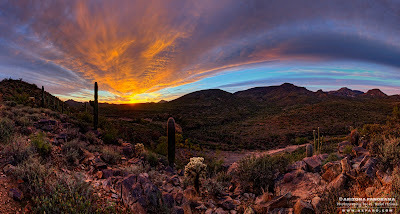 This area has so many photographic possibilities and is a surprisingly calm and peaceful place considering how close it is to the Phoenix metro area. On this day, I saw no other hikers and only a couple cars passed me on the road. See my Fine Art America gallery for a variety of high-quality products from individual prints and canvas wraps to metal prints and frame and matted works of photographic art. Why use a Professional Real Estate Photographer? 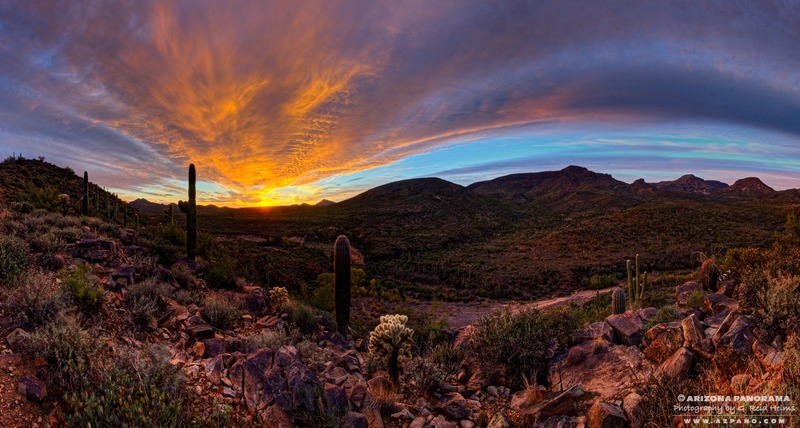 ©2012 G. Reid Helms / Arizona Panorama. Simple theme. Powered by Blogger.